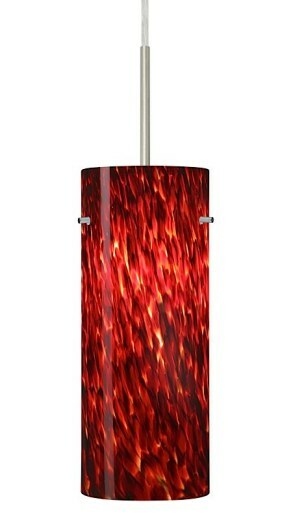 The Stilo 10 mini pendant is a modern open top cylinder glass pendant shown in garnet. With beautiful, high quality handcrafted glass, this pendant will add just the right look to your kitchen or other living space. Lamp is is 100W incandescent, suitable for dimming. Bulbs not included. Suitable for damp locations (interior use only). Select from satin nickel or bronze finish and two suspension types. Cord Hung Suspension: 10' cord, complete with 5" decorative sleeve at the socketholder. Stem Mount Suspension: 4 connectable stem sections (3", 6", 12", and 18" lengths) plus telescoping piece for up to 3" adjustment, 10' max. 5" diameter canopy and stem sections are plated steel. Flat canopy.